Owner Tony Kirby was named the CYCA’s 2017 Ocean Racer of the Year after taking the Blue Water Pointscore championship, topping the IRC and ORCi divisions. 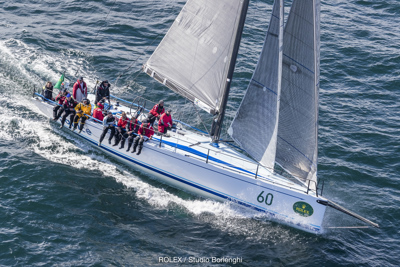 Kirby has extensive offshore sailing experience, including 35 Rolex Sydney Hobarts – capped by last year’s third-placed IRC, first in IRC Div 2 and second in ORCi Div 2 in his latest Patrice. Last year’s results were a big success for Patrice, with three retirements in four previous Hobarts races to 2016. 2018 has been a successful year for Patrice, with key results including third IRC/ORCi in the PONANT Sydney Noumea Yacht Race, first IRC/ORCi in the Groupama 600 Round Noumea race, third IRC in the Australian Championships and second IRC in the NSW Championships. 2018 also marks the 10th year that Tony and the Patrice crew have been raising funds to support The Kids’ Cancer Project. For the first time, the Patrice crew will be joined by The Kids’ Cancer Project’s CEO and former Wallaby, Owen Finegan, to help make this year’s fundraising the best ever.